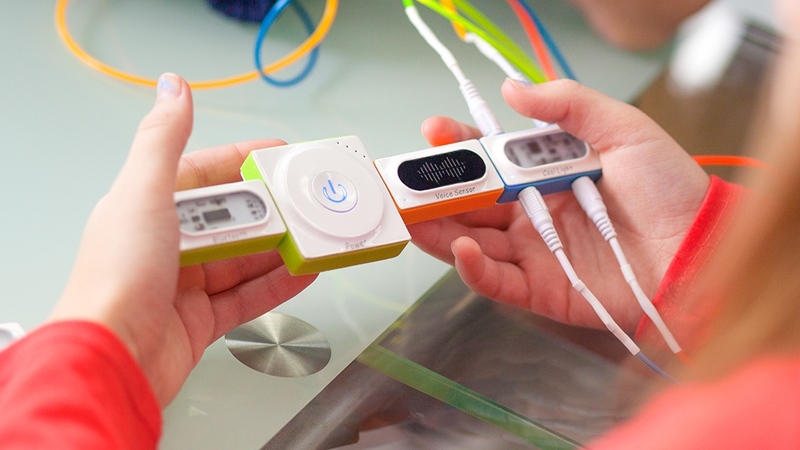 Makeblock's Neuron, which consists of programmable building blocks that can teach kids gadget building. Makeblock, a DIY and STEM education robotics construction company, has received the Red Dot Award 2017 for product design for two products: Airblock, a modular and programmable drone designed for STEM education; and Neuron, a programmable building blocks platform that teaches kids gadget building. The Chinese robotics startup announced the awards today at the CeBIT 2017 Conference in Hannover, Germany. A jury of experts appraises the best products of the year in the international Red Dot Awards competition. Manufacturers and designers from around the world submit originals of their latest products in 47 different categories. Products are judged based on criteria such as innovation, formal quality, functionality and ecological compatibility. Makeblock’s products were deemed winners in the Drones & Action Cameras category for the Airblock and the Babies & Children category for the Neuron. Winners will be formally announced at the Red Dot Gala on July 3 in Essen, Germany. Airblock launched via Kickstarter in October 2016, raising more than $829,000, and began shipping to backers earlier this month. Neuron is currently available for preorder on Kickstarter starting at $39, and has already raised more than $246,000 — more than doubling its initial goal. 2017 is a year of growth for Makeblock, according to a news release, made possible by an infusion of $30 million in series B capital funding earlier this month to help with international expansion and product development. For more information about Makeblock, visit the company’s website.